Not only is it a cool word – dusk! – it is also a fantastic time for photography. For about 20-30 minutes after sunset the light is otherwordly and magical – remember to not pack away the camera once the sun has set because this is when it gets really good! It’s also by far the best time to do night photography ‘cos you have mixed lighting – still some light in the sky mixed with light from buildings etc. Have a look at the two examples in this post. This is from two days ago in Copenagen and just after sunset on a rainy day with lots of dramatic clouds and the light was something special. I didn’t even think that much of it when I shot the pictures, was in a bit of a hurry, but when I got home and looked at the shots they had some great clouds and magical colours. Did I write “summer days” ? These very long (sunset after 10pm) northern summer days have the perfect light for photography. “Golden Hour” is a very long hour indeed and dusk lasts for a long time. Almost makes up for those long dark cold winters! Although if you wish to shoot the sunrise don’t bother going to bed, you need to get up around 4am. These two shots are from Lake Peblinge in Copenhagen and I shot them around 10pm on a quiet warm and very nice … Northern Summer Evening! As always – click to see full size on my website. 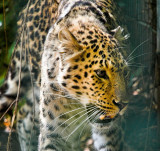 The Amur Leopard also known as the Siberian Leopard is the rarest subspecies of leopard. They have two at Copenhagen Zoo and they’re beautiful animals. They’re unfortunately behind a thick wire fence making them very hard to shoot, but sometimes you get lucky. The picture on the right is from my visit today to the zoo and one of the few that came out reasonably ok.
One of the tallest office buildings in Copenhagen has been restored and they had an open house event where the public was allowed access. Naturally I ignored the fancy restored offices and raced up the stairs to the top floor which has an outside balcony. I shot this pano from up there and it’s not a view of Copenhagen you see everyday. The pano is 6 images stitched in the amazing PTgui Click the image to see 1600 pixels wide version on my website. EDIT: Just added a sepia toned version of it, done with a OptikVerveLabs filter. Got this in my mail today: The new CD “Dream days at the Hotel Existence” from Powderfinger, one of my favourite bands. Been on repeat for the past few hours and it’s highly recommend! Powderfinger are from Brisbane (Australia of course) and I was hoping I might be lucky enough to see them live later this year. No such luck though, they’re embarking on a huge tour with Silverchair but I won’t be able to catch them, our paths will not cross unfortunately. Oh well, at least the cd rocks! Well…not entirely new design, “slightly altered design with new elements” may be a more fitting but also a less interesting headline I reckon. I redesigned the header graphic and added a menu with links that should make it easier for visitors to find my blog, profile, email etc. I’m very happy that Pbase allows html in the header so we can customise our pages. And I’m very happy that http://www.w3schools.com/ exists for those of us who can’t quite remember the entire syntax for a table definition!